Kanga® KeepU-Dri is a reusable bandage and plaster cast cover for arms legs and feet , allowing you to swim, bath and shower whilst keeping your cast or bandage completely dry. Kanga® KeepU-Dri is highly flexible, puncture resistant and abrasion proof and will outlast the average life of a plaster cast. Kanga® KeepU-Dri is easy to use. Simply measure the circumference of the limb above the bandage or plaster cast, and select the appropriate size. This is the only product on the market that you can swim with, that will keep your cast fully dry. 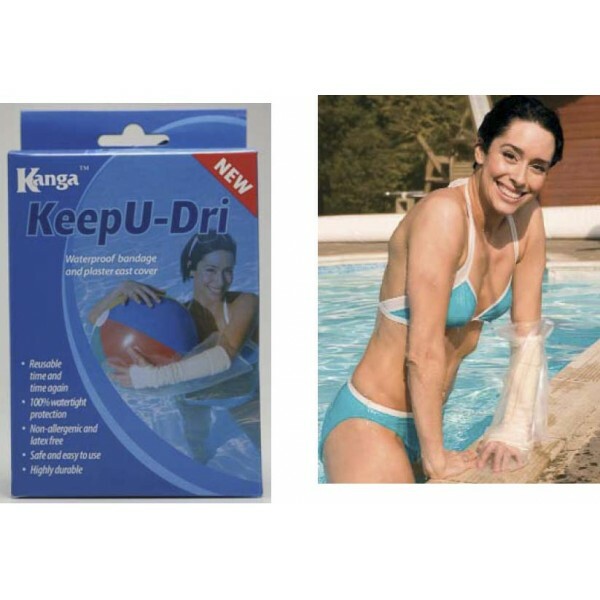 Keepu-dri cast covers effectively protects bandages and plaster casts when taking a shower, while bathing and swimming in the pool or the sea. Made from tough, non-allergenic skin friendly polyurethane, a material renowned for it's strength and elasticity. It is highly flexible, puncture resistant and abrasion proof. Keepu-dri bandage covers will not tear when pulled over plaster casts and slides on easily to form a comfortable, water tight seal.